Welcome to Day 2 of our Q and A with Travel Writer Lara Dunston! See the first part of the interview here. 3. Obviously you’re an expert traveler. 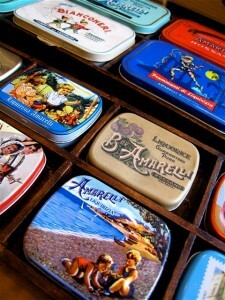 Tell us a bit about how you pack, e.g., how long does it take, what are the “must” pack items? I’m actually the last person to ask about packing because while I do apply good techniques – rolling clothes tightly, separating clothes onto one side of my Samsonite and everything else (shoes, toiletries, cosmetics, books etc) on to the other – I am not travelling for holidays so our needs are very different to someone going to Paris for a week or backpacking around Europe for a few months. Terry and I quite literally live out of our suitcases – we’ve been on the road for 3.5 years now, bouncing around the planet from one commission to another. So our bags are our homes and we travel with everything we need to be able to set up and work wherever we are. Therefore we have a lot of technology, laptops, cameras, collections of adaptors and cables, and Terry has dozens of drives with his photos on them. I also carry around things the average traveler wouldn’t, like a collection of DVDs of favorite movies and TV shows that we watch during down time when we want to stay in of an evening and pretend to be normal. I’m also a last minute packer. I never allow more than a few hours to pack. I’ve done it so many times, that there’s really nothing to think about. The only time I might pack 24 hours before, and then re-pack at the last minute (discarding non-essentials), is if we’ve been in one place for a while and have gathered lots of stuff, especially research materials. But we have an attitude that if we forget something we just buy it, and if we have too much gear we send it to my sister’s or aunt and uncle’s, who both have big houses and they store it for us. 4. I’m a firm believer that voracious reading greatly benefits writers; who are your favorite travel writers? I totally agree with you but as a busy working travel writer, I actually have little time to read anything that doesn’t relate to the place I’m researching. I used to read far more travel literature before I became a travel writer. Then my favorite writers were people like Paul Theroux, Robert Kaplan, Freya Stark, and Jan Morris. Now, what we usually do is buy literature by writers who have written about the places we’re travelling in, so for instance, we read Laurence Durrell’s “Bitter Lemons of Cyprus” while in Cyprus last year. Or we pick up stuff by local writers. 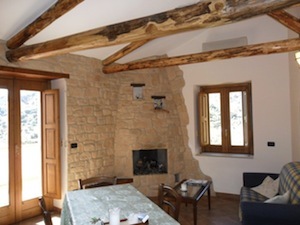 We’re in Mallorca at the moment, so I have George Sand’s “Winter in Majorca” by my bedside, and I’m trying to get hold of the books written by the children of Robert Graves, the English poet and novelist who lived here for much of his life, who still live in Mallorca apparently. One book that I always travel with, however, is Alain de Botton’s “Art of Travel” because I’m really interested in why people travel, their motivations, inspirations and expectations, and what they get out of travel (I actually started a PhD on the connections between film and travel many years ago) and so I dip into that book every now and again and it constantly helps me to think about travel in new ways and deepens my understanding about what we do. More *fabulous* answers! Thanks so much Lara! Come back tomorrow for more with Lara as she shares what life as a travel writer is *really* like–you aspiring travel writers will especially appreciate her thoughts! I’m hooked. Can’t wait to read tomorrows entry. The Art of Travel sounds very interesting. Looking forward to the rest of the Q&A. I have always loved Paul theroux’s books but never heard of Botton’s “Art of Travel.” Will have to seek it out. I haven’t read it either; sounds like I’d love it though! .-= Ciaochowlinda´s last blog ..Stuffed Zucchini =-. Another entry! 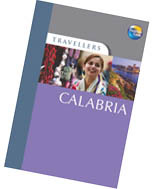 I’m on a roll (and really want to go to Calabria!)! Stay tuned, Laura…lots more coming! 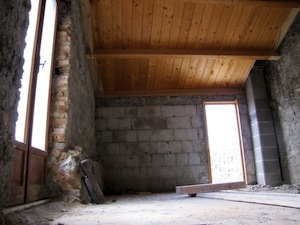 .-= Laura´s last blog ..Let’s Be Beside The Sea =-. Great post! Thanks for the book suggestions–I’m going to look for a couple of those. This is a very interesting post..I cannot imagine living out of a suitcase for all that length of time, I suppose if it is your job, it will take some getting used to and then it is easier as time goes on. Can’t wait to read more! 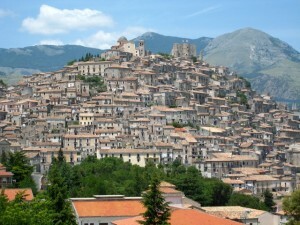 I’ve got the bug to travel…..hmmm…maybe Calabria! I’m having so much fun with this series! Today, particularly, as I’m fascinated by those who can live on the move all the time. 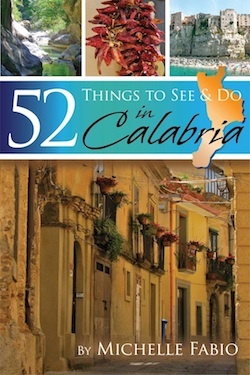 I’ve been dreaming of visiting Calabria again, and this would be the book! Looking forward to reading the rest of your interviews. I love the fact that I can travel so lightly overseas, whereas in Melbourne I live in a house which I dream of making “minimilista”. I did the Camino and managed to limit the backpack to 8 kilos. 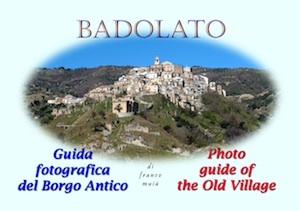 By the way – where is that photo taken – the photo of the village spilling down the mountain – and it looks like a castle just sitting at the peak? Just stopping by for a little hello. I’ve been away from the blog world for so long but I picked a great day for a visit! I get to read your fabulous Q&A and have a chance to be a winner. Well, it’s been wonderful as always! Ciao bella! 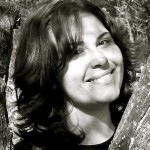 .-= Debbie Egizio´s last blog ..My Mom still hangs laundry on a clothesline =-. I just wanted to respond to Anne: it actually gets harder to live out of a suitcase the longer you do it. I know it shouldn’t. But you start to get bored with your clothes, so you buy more; you buy a book to read, or a DVD to watch because some nights you want to stay in and pretend to be “normal”. Occasionally you might buy a gift for someone or a small souvenir, and keep momentoes, and so – along with the technology and research materials we have to carry, it all starts to weigh a lot! So every now and again I’m forced to leave a bag with a friend or family. As a result I have things all around the world! The travel is the easy bit, however, and it becomes easier (aside from the luggage factor! ), the more you do it, so that jumping on and off planes for us is like getting on and off buses for others. We know how all the airlines work and the ins and outs of buying tickets and the best times to visit certain places. We don’t plan ahead – I just bought flights online for our trip from Palma de Mallorca to Barcelona next week, then Venice the week after, and Dubai after that. And mentally, well, we never get homesick for anywhere. We miss family and friends of course but we visit them all around the world. We’re with eachother and that’s what matters most – we could live anywhere together frankly and be happy, so – and I hope this doesn’t sound pretentious – we really do feel like citizens of the world. 3.5 years living out of a suitcase, as wonderful as traveling all over the world would be I could not do that. What’s the longest they’ve stayed in one location? I’m going to Switzerland in September so these tips are well needed.